A tostada is made with a crunchy open tortilla (you can find them pre-made at your local grocery store or even on Amazon .) They are used as a base to layer on lots of toppings. You can make them with shredded beef, chicken or pork plus beans, vegetables, and avocado. Oh! And let’s not forget the salsas! They can be mild, spicy or flaming hot. My personal opinion is that the salsa makes the tostada. Now the fun part begins! To make a tostada, first grab the corn flat tortilla. Then spread the refried beans all around (make a nice even coat), and add the shredded chicken. 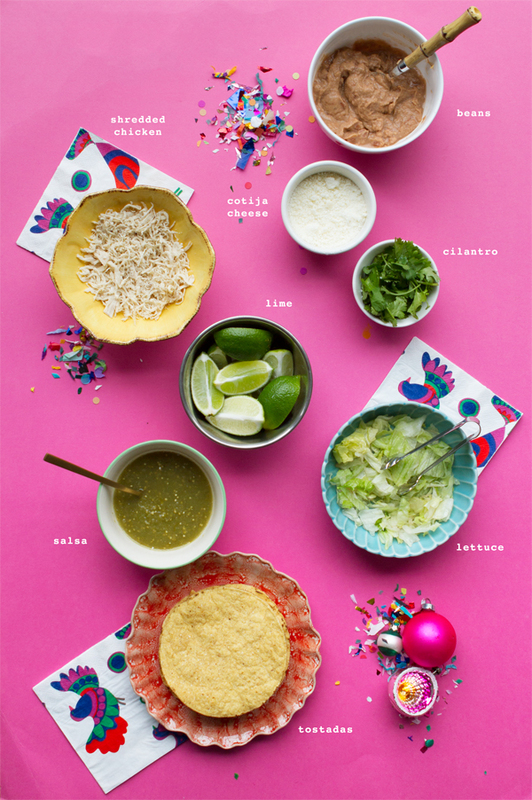 Add the rest of the toppings: lettuce, cheese, green salsa, a squeeze of Daisy and cilantro on top. We set all the toppings in colorful, mismatched bowls and try to make it really easy for everyone (including kids!) to dish out themselves. 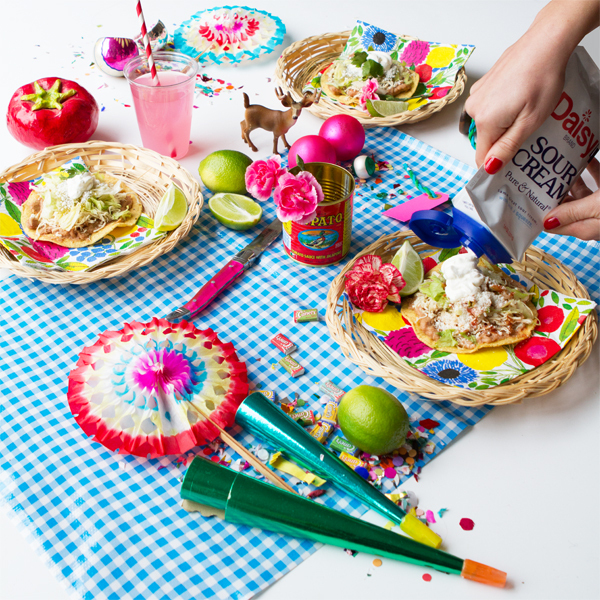 For this party, we tried out Daisy Sour Cream‘s Squeeze Bottle to top of all the tostadas. It meant we had a fewer dishes to wash up at the end, less of a mess at the table, and the kids loved squeezing the sour cream themselves. For holiday party decorations, I love lots of bright colors. 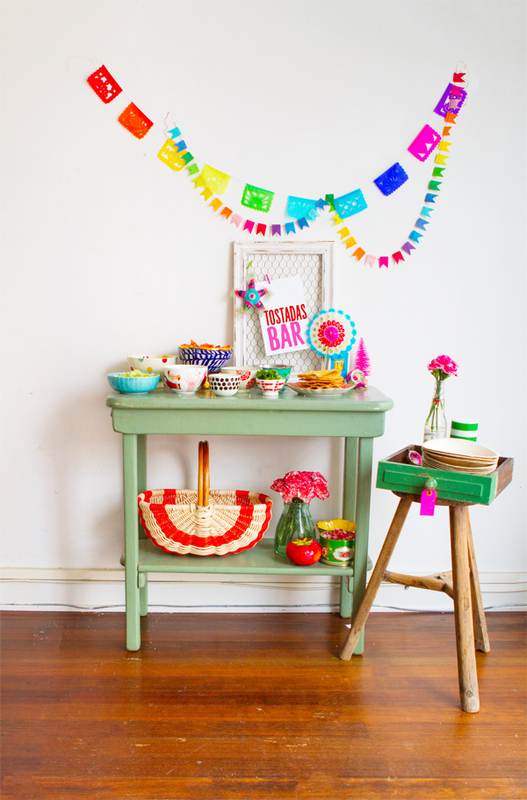 Rainbow papel picado and flowers look great with vintage ornaments and mini Christmas trees. Such a yummy recipe, thank you for that! Viví en México por seis meses y tostada es uno de mis platos favoritos! Qué buena idea! Me encantan tus fotos! This looks like so much fun! I would never think about something like this at a party or a games night. Awesome idea, thanks for sharing! 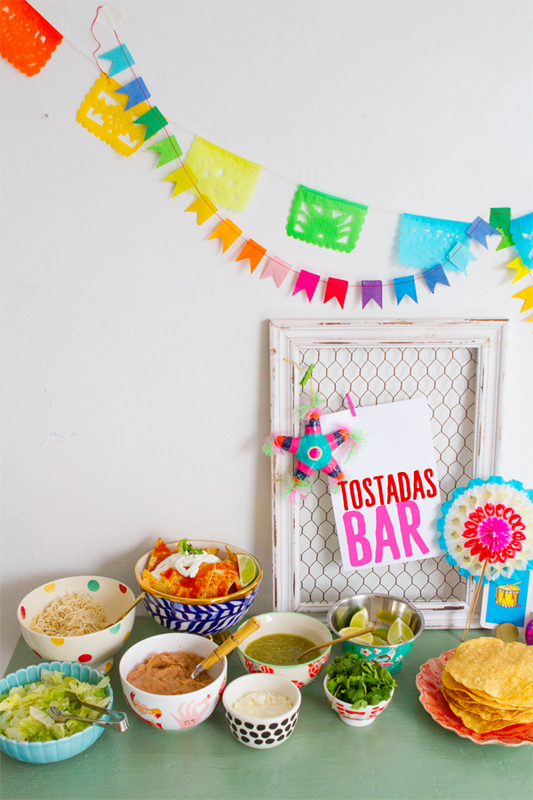 What a fun and casual idea for a party! Love that everything is so colorful! Hola! 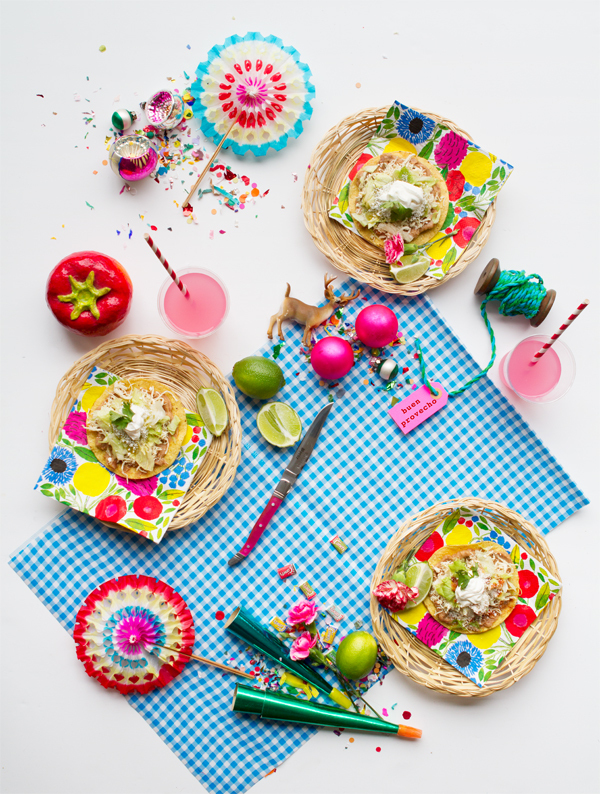 I was wondering if I may repost one of your pictures of these tostadas on my instagram? properly tagged of course.